With the breeding season in full swing, Swettenham Stud’s stallions are bringing a smile to the faces of stud masters and breeders around the country, thanks to their stallions performing brilliantly in the breeding shed. “We are over the moon with how well the stallions are covering this season. It’s a great result for our clients that their mares are getting in foal thanks to the high fertility of our stallions,” Nominations manager, Sam Matthews enthused. Resident Vet John Hurley plays a vital role in this success, being highly regarded throughout the breeding industry as an outstanding reproductive veterinarian. “Throughout my 27 years at Swettenham, I am delighted that to see these two stallions as well as our other resident stallions, can cover high numbers of mares with consistently high fertility. We are maintaining our 93% fertility rate for on-farm mares this season, ensuring that our clients have the best possible chance of getting their mares in foal and maintaining a viable pregnancy,” Hurley said. Matthews also wanted to acknowledge the Swettenham Stud team as a whole, who are all performing above and beyond for the farm. And the bookings have continued to flow in for seven-time Group 1 winner Highland Reel now that breeders have had a chance to see him in the flesh. “He has really impressed the breeders being such a terrific physical type. A well-conformed and attractive stallion that is bred on the same cross as Frankel. With Galileo continuing to be the greatest sire and sire of sires in the world, and with him being a Group two winning two-year-old over 1400 metres – he ticks all the boxes,” Matthews said. Will a Victorian-bred Runaway with the Melbourne Cup? For Rosemont Stud, it has been a week to remember, when Rosemont’s bred and raced, Runaway, won the much-coveted Group 3 Geelong Cup, before another homebred, Iconoclasm raced onto the second line of betting for the Group One Kennedy Mile after capturing the lucrative VOBIS Gold Star over 1500m at Moonee Valley. Runaway will be flying the flag of Victorian stallion Manhattan Rain who stands at Blue Gum Farm, while Iconoclasm is a son of Toorak Toff who raced to multiple Group 1 success by Rosemont and stood his first five seasons at the farm. Having won the Listed VRC St Leger at Flemington in April and the Geelong Cup (receiving a 1.5kg penalty), the Manhattan Rain sired is now 23rd on the order of entry for the $7 million 2018 Group 1 Melbourne Cup (maximum 24 runners), with a couple still doubtful to take their place in the field. Mithen, a highly respected media commentator before shifting his full-time focus to the racing and breeder caper, reckons Runaway will need to win the Melbourne Cup to “toss” the Geelong Cup victory from the prime spot on the trophy cabinet. “I grew up in Geelong, the farms are all near Geelong, my brother-in-law, Nigel Austin (founder and principal of Cotton:On clothing) has a marquee at the Geelong Cup and Rosemont has its end of year party at the course,” Mithen reveals. 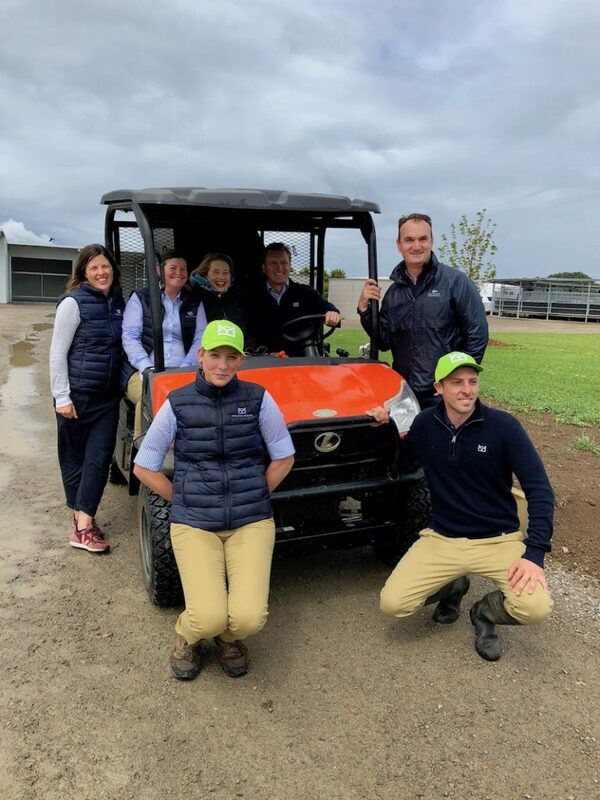 The Rosemont operation now encompasses three farms – ‘breeding’ at the former Makybe property at Gnarwarre, ‘pre-training’ at Lara and ‘spelling on their original property at Ceres. They currently stand three stallions, reside around 150 mares and have around 100 part or fully owned racehorses in training. Aside from hopefully cheering on Runaway in the Cup, along with multiple Group placed, True Excelsior, in the Group 3 Furphy Sprint this Saturday and 2 year-old stakes-winner and multiple stakes-placed, Split Lip, in the Group 3 Hong Kong Jockey Club Plate over 1400m on Cup day, Mithen will be also keeping a particularly close eye out for Iconoclasm in the Group 1 Kennedy Mile. 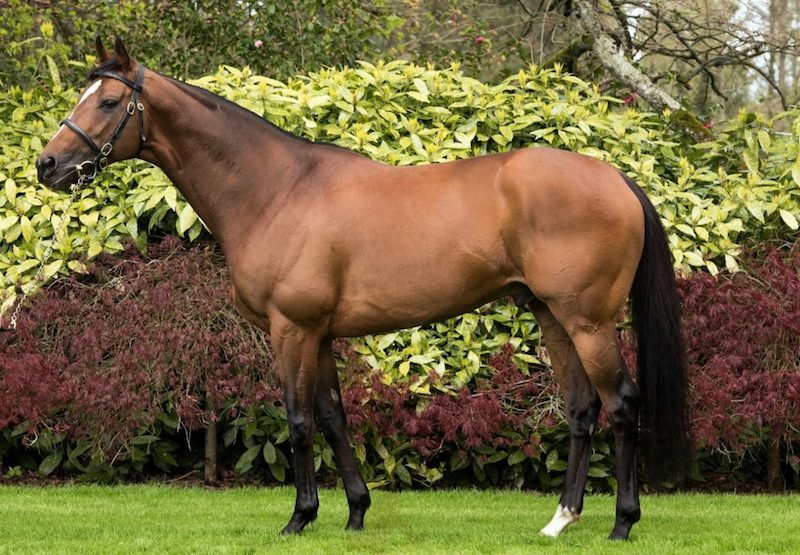 Runaway is out of the 4-time winning Catrail mare, Catshaan – a half-sister to Champion Japanese Sprinter/Miler Kinshasa No Kiseki and closely related to Group One winner and sire, Groom Dancer. Since first heading to stud in 2003, Catshaan has produced six winners from seven to race including Group 1 winners Abbey Marie and Absolutely (both by Redoute’s Choice) and now Runaway. “Catshaan has been tremendous value as we picked her up for $160,000, carrying Runaway, at the 2014 Magic Millions National Broodmare Sale,” Mithen points out. “She had already produced a Group One winner in Absolutely, she was in foal to Blue Gum Farm’s Manhattan Rain – a three-quarter brother to Redoute’s Choice – and we got a free update about 12 months later when Abbey Marie won her Group One. With the crowd still buzzing after the record-breaking fourth Cox Plate victory of Winx, Sun Stud’s Melbourne Cup hero Fiorente (IRE) chose a good time to record his first stakes-winner when Robbie Laing’s Victoria Derby bound colt Stars Of Carrum broke his maiden in the Group 2 Moonee Valley Vase over 2040m. A fast rise to Group fame, Stars Of Carrum was beaten in a Bairnsdale maiden two starts back, but was a hard-charging second in the Listed Hill Smith Stakes (1800m) at his most recent start. Being the only horse Laing purchased at the 2017 Melbourne Premier Sales, Stars Of Carrum was a $75,000 yearling out of the Sun Stud draft and is co-owned by racing enthusiast Peter Cox and a few crew at Carrum Football Club who Laing used to play with. Sired by Group 1 Melbourne Cup and Group 1 Australian Cup winner Fiorente (IRE) he is a son of Monsun, who has written himself into Melbourne Cup history as the sire of three of the past five winners. 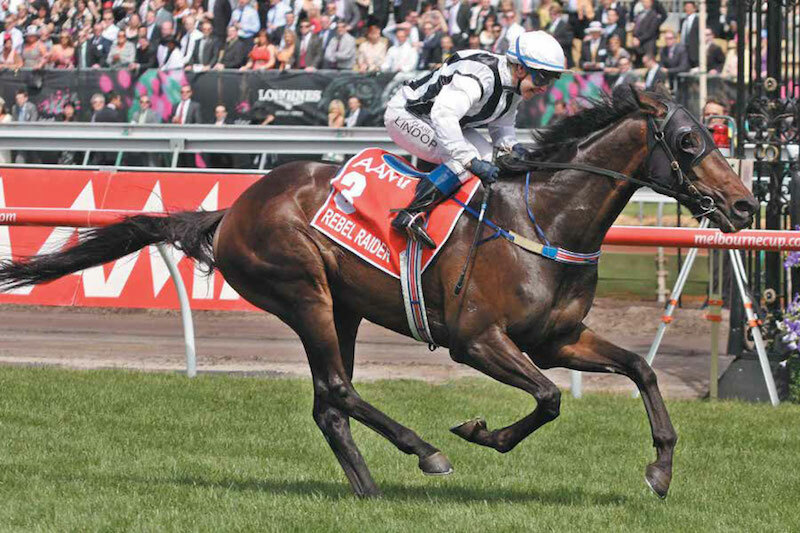 Sun Stud’s Mark Lindsay believes Monsun’s bloodlines can reinvigorate the staying breed in Australia in the coming years. “It was what we hoped would happen. We thought with the breed, and the Monsun line, he would succeed once his runners neared 2000m. It’s a huge boost for Fiorente with Stars Of Carrum being part of his first crop.” he said. Lindsay said that the depth of 3-year-old staying races up until this point had made it difficult for Fiorente’s progeny to make an impact until recently, but three winners in two weeks has given the stallion a timely boost. Stars Of Carrum now heads to one of the feature races of the spring, the Group 1 Victoria Derby, along with another of Fiorente’s first crop, the Robbie Griffiths-trained Alessandro, a recent winner against the older horses at Cranbourne. “Yesterday was a bit of a jackpot for us, with the Derby the week after. If Alessandro and Stars of Carrum can be there, that’d be pretty good. We’ve sold the story and sold what we need to.” Lindsay said. Fiorente is the only son of Monsun standing in Australia and is currently covering his fifth book of mares at Sun Stud for a fee of $17,600, while Stars Of Carrum dam, the 7-time winning Anabaa mare Signoret is from the family of Jameela, the Group 2 SAJC Marsh Classic winner and Group 1 South Australian Oaks runner-up. Signoret’s filly by Fighting Sun made $115,000 to the bid of Ellerton Zahra Racing at the 2016 Premier Yearling Sale and is now currently in foal to Sun Stud’s Palentino. 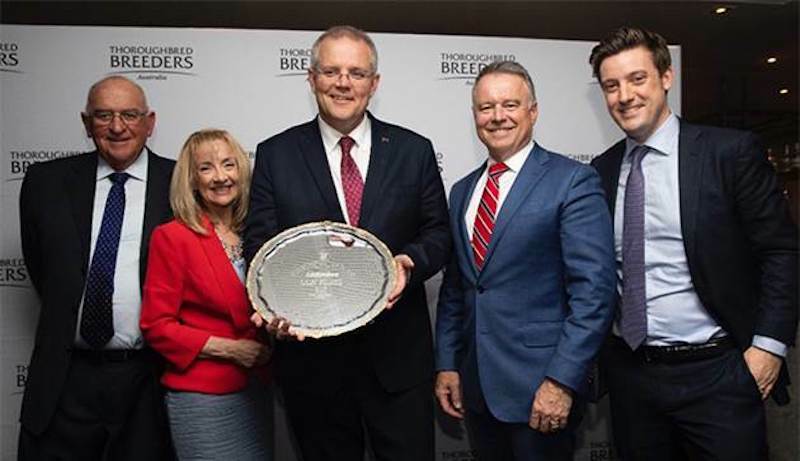 Thoroughbred Breeders Australia (TBA) hosted an evening with the thoroughbred breeding industry at Federal Parliament House, Canberra in conjunction with the bipartisan group, the Friends of Primary Producers. As with two previous events we’ve held with this group, we were fortunate to get a huge turnout of politicians, including the Prime Minister, Scott Morrison, Deputy Prime Minister, Michael McCormack, the Leader of the Opposition, Bill Shorten, and Agriculture Minister David Littleproud. The event gives breeders an opportunity to explain our industry to politicians, to discuss its huge economic impact and, of course, the chance to build and develop relationships with people whose decisions often impact upon our industry. I’m pleased to say we had great support from amongst breeders, with TBA members from across the nation attending. As well as the public event, TBA was able to secure private meetings with Scott Morrison, David Littleproud, Bill Shorten and shadow Agriculture Minister Joel Fitzgibbon. These meetings gave us to the time to discuss some of the key issues facing breeding, from the drought through to quarantine, visas and training. Both Mr Morrison and Mr Shorten were very interested and supportive of the TBA’s national training scheme, Fast Track, which was initiated this year to provide a clear pathway into the breeding industry. Tuesday evening’s event was also a celebration of the breeding industry and I am very grateful to the connections of Winx; Peter and Patty Tighe, plus Debbie and Paul Kepitis, for giving up their time to talk about their champion, who is such a flagbearer for the Australian breeding industry. Also among our guests was Michelle Payne, who talked about the challenges of training, plus the love for the animal that all in breeding and racing have. More than 150 people attended the event and heard the Prime Minister say how important breeding and racing is to the country. “It is a fair dinkum, serious business and industry,” Mr Morrison said. “It provides significant economic and employment opportunities especially for rural and regional Australia. Labor leader Bill Shorten reflected on the needs of the industry, saying his side of politics heard the industry “loud and clear” on issues like drought relief and labour shortages. He said breeding was a great industry that couldn’t be taken for granted, noting the importance of farming and the investment of breeders into racehorse ownership. It is also important to acknowledge the government’s Chief Whip, Nola Marino, and Joel Fitzgibbon, the member for the Hunter, who are the co-conveners of the Friends of Primary Producers. Both are great supporters of the industry and they and their offices worked tirelessly to ensure the event was a success. Mr Fitzgibbon said the event had continued its history of reminding us the racing industry begins on a farm. This event is a vitally important one in the Thoroughbred Breeders Australia’s calendar and the relationships it helps us to develop have already delivered strong dividends for the industry with funding for equine research, development of quarantine procedure and changes to visa regulations. At 5pm on Saturday afternoon, Russell and Caroline Osborne were tuned in to Moonee Valley to watch history being made. They cheered from their lounge room, fortunate to watch one of the greatest moments in racing when Winx brought home her fourth Cox Plate. But with no time for a Guinness, by 5.15pm, Russell and Caroline were back in the breeding shed trying to create their own piece of history as Lions Kiss, their most beloved broodmare, was due to be covered by Winx’s little brother and their resident stallion, Boulder City. Quite uninterested in the news that his big sister had triumphed yet again, he was much more interested in the lovely stakes-producing mare that had come to pay him a visit. With Lion’s Kiss’s progeny earnings in excess of $475,000, including the stakes placed Pretty Possum it will be a highly anticipated arrival next spring. Boulder City, the unraced half-brother to Winx is a breeder’s dream. With a pedigree the envy of most, he is by reigning Champion Sire, Snitzel. Australia’s highest priced stallion, super sire of 83 stakes winners including 13 Group 1 winners with progeny earnings in excess of $105 million. While his dam and the dam of the mighty Winx, Vegas Showgirl was a stakes-winning sprinter who has produced the greatest racehorse of all time, with Winx now earning over $19 million, and four W.S Cox Plates. The pair has already proved capable of producing a group level horse in the brilliant but ill-fated Group 3 winner El Divino, so when small issues were hindering a successful career on the track for Boulder City, the difficult decision to retire him to stud was made. “He had issues that were becoming harder to manage and after the devastating loss of his full brother the owners decided to meet the market demand and offer him at stud,” said Russell Osborne. 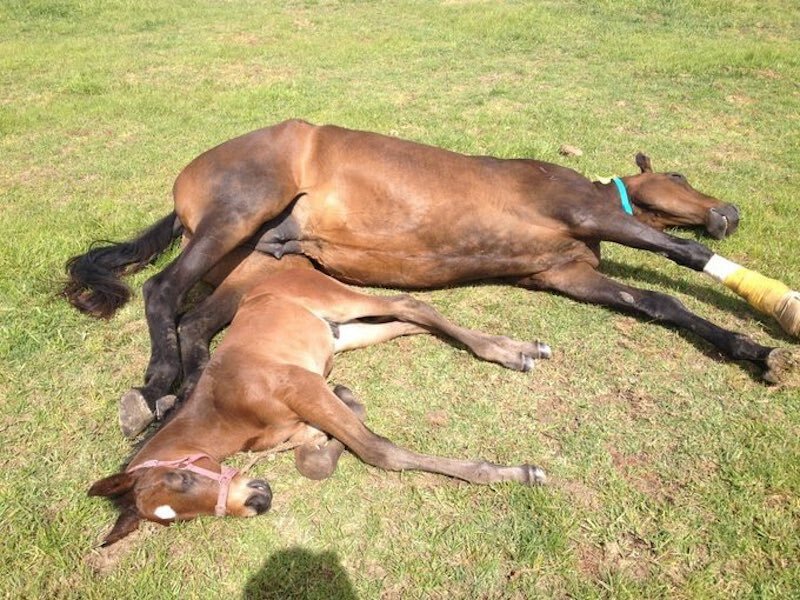 While Riverbank Farm’s Caroline Duddy and resident equine reproductive vet offers help to mare owners to meet the high cost of thoroughbred breeding. “Boulder City has been working really well in the covering shed, matched with excellent fertility. He has taken to breeding like a true professional. He is just a super horse to handle and we are thrilled with him,” Duddy said. 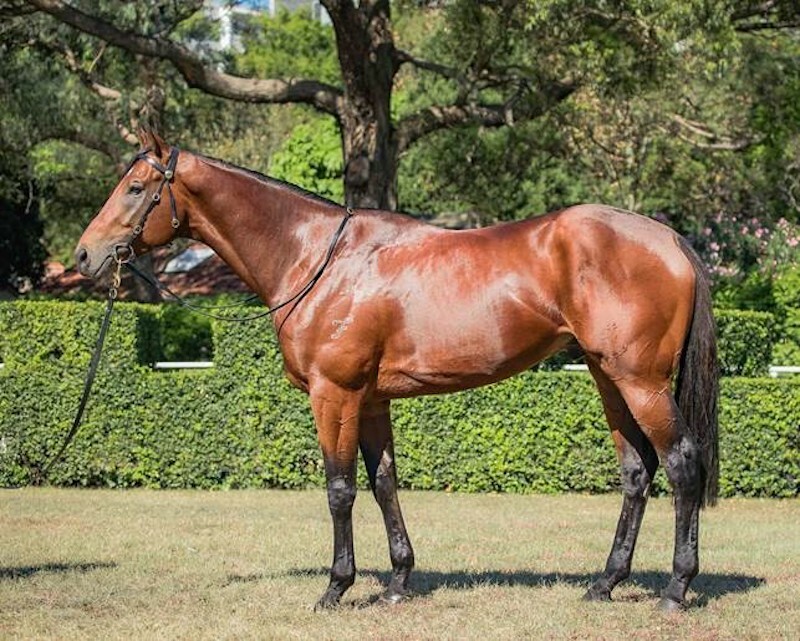 Boulder City has had a very busy debut season in north-eastern reeding region of Victoria, at Benalla’s Riverbank Farm with a large book of mares to give him every opportunity to hit the track running. “It is hard work standing stallions, and we are delighted with the numbers of mares he has received this year, covering a very solid book of around 100. We want to thank all the trainers, local breeders and breed to race breeders that have supported him,” Duddy said. With Boulder City’s half-sister Winx racing now claiming a history making fourth Cox plate and his dam Vegas Showgirl having been covered by Japan’s superstar stallion Deep Impact, this exciting young horse’s pedigree is only going to improve. 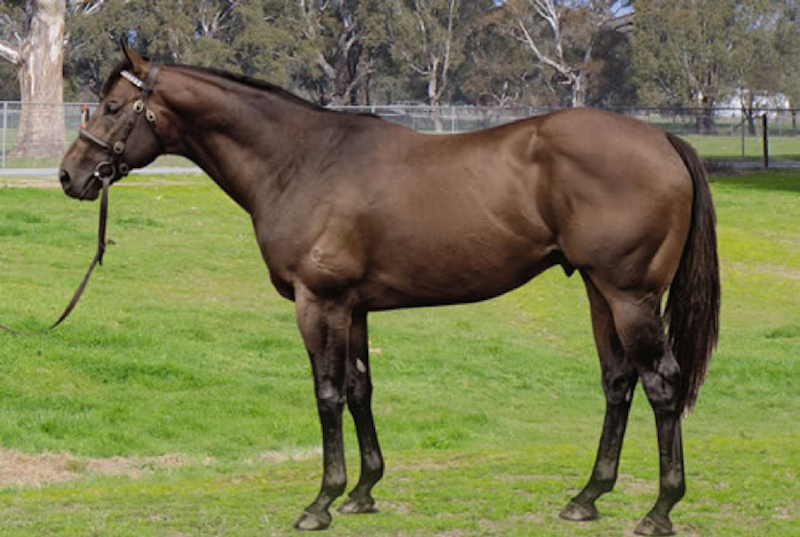 Standing at $5,500, for more information on Boulder City who stands alongside Redente, Skilled, Wayed Zain and Von Costa de hero, please contact Russell Osborne on 0423 768 155 or visit www.riverbankfarm.com.au. Bob Scarborough may have sold his showpiece Wood Nook Farm in Nagambie, but the former Moonee Valley Racing Club chairman and passionate Victorian breeder is still making his presence felt in the breeding world. 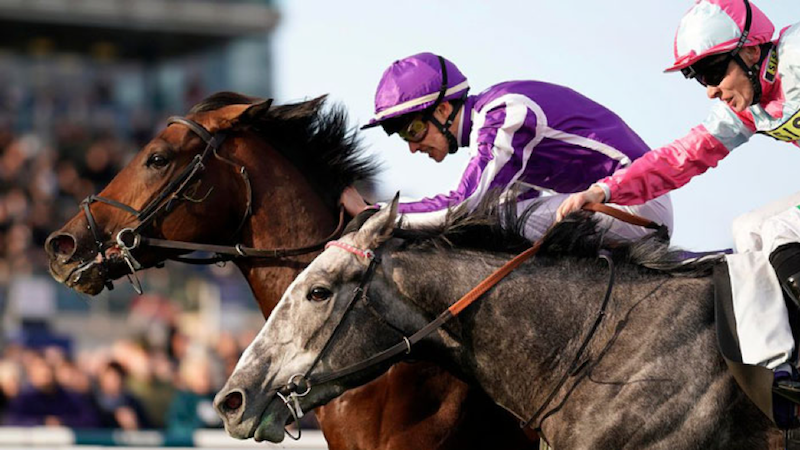 At Doncaster on Saturday, the Wood Nook Farm bred colt Magna Grecia won the final Group 1 of the British Flat season, the Vertem Futurity Trophy (formerly the Racing Post Trophy). The Aidan O’Brien-trained son of Invincible Spirit was making his third start after a dominant maiden win Naas by three and a half lengths before finishing second to the promising Kingman colt Persian King in the Group 3 Autumn Stakes over a mile at Newmarket. “It was a wonderful result and although I didn’t see the replay of the race till the next morning, it was a great way to start the day when all the text messages came through from friends abroad congratulating me on the win,” Scarborough said. Scarborough sold Magna Grecia through the Norelands Stud draft for 340,000gns at the 2016 Tattersalls December Foal Sale to MV Magnier, Peter and Ross Doyle and Mayfair Speculators. 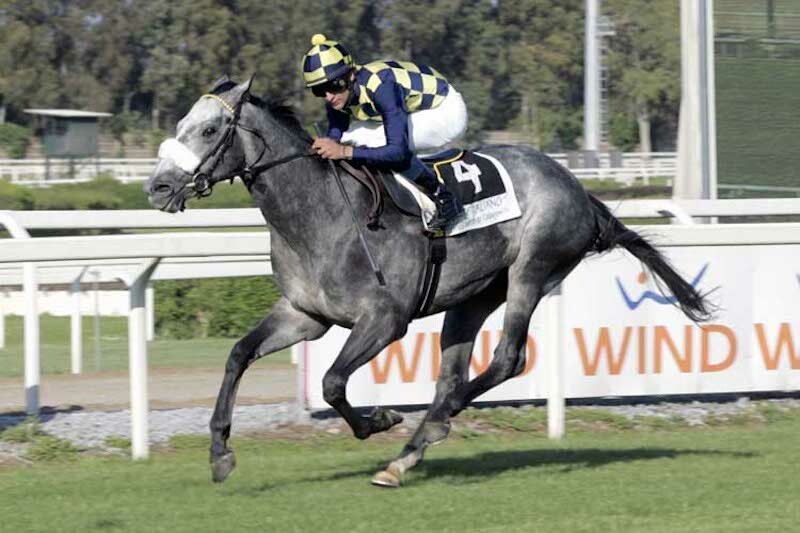 He had purchased Magna Grecia’s dam Cabaret for 600,000gns at the 2011 Tattersalls December Mares Sale. A daughter of Galileo, Cabaret won the Group 3 Silver Flash Stakes over seven furlongs as a juvenile. Cabaret is catalogued in the Norelands draft for the upcoming Tattersalls December Mares Sale but will be withdrawn, with Scarborough understandably changing his mind on selling. “I own Cabaret outright, and she will definitely not be going through the sale now. You just can’t buy a Group 3 winning Galileo mare that has produced a Group 1 winner. She would attract every Sheik and leading breeder around the world, and I certainly wouldn’t be able to buy her. You have to hold on to the good ones when you have them,” Scarborough said. Still passionately involved in breeding, Scarborough has been breeding in the Northern Hemisphere for around twenty years and manages a high-quality broodmare band of six mares aboard. “I was always interested in breeding globally and selling into the international market at their bloodstock auction houses,” Scarborough said. And while there are many success stories for Scarborough, there are also a few green monkeys, and more than one great stories to share about the tough game of breeding. But as for Magna Grecia, through Scarborough, she will continue to fly the flag for Victorian breeders abroad, with the illustrious Wood Nook brand fortunate to add another Group 1 winner to their distinguished honour board. As a breeder-owner, few horses have provided owners with as much joy as the big-hearted, front-running galloper Cliff’s Edge, especially when he has become Australia’s latest equine millionaire. 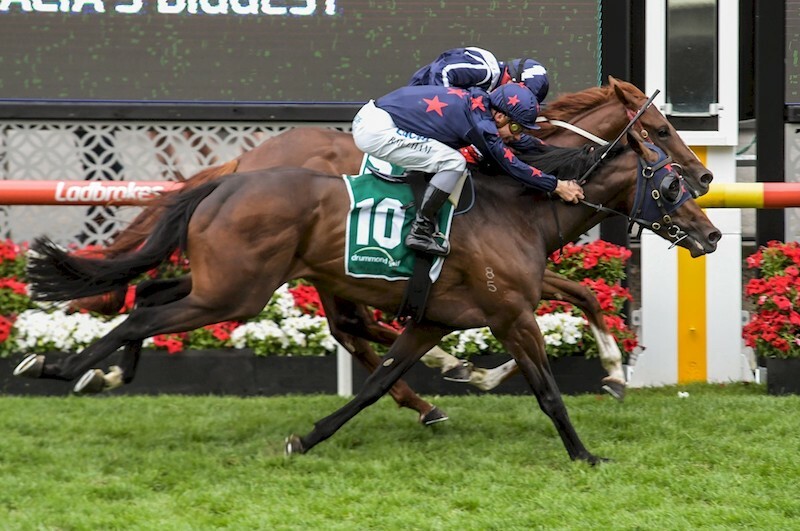 Having battled his way to a half-length win over Prized Icon in Saturday’s Group 2 Schweppes Crystal Mile over 1600m at Moonee Valley, the success was the fourth now at stakes level, with Cliff’s Edge advancing his record to 8 wins and 4 seconds from 21 starts with earnings of $1,033,960. The son of Blue Gum Farm’s former shuttler, Canford Cliffs, ‘Ciffy’ has become a crowd favourite always putting 100% into each and every run and for brothers, Racing photographers, part owners and breeder, Ross and Brett Holburt, they certainly love their job when they are photographing their favourite horse in the winner’s circle. The four-year-old entire will now be given his chance for Group 1 glory as indicated by trainer Darren Weir when he backs up in next week’s $1 million Group 1 Kennedy Mile at Flemington. Cliffs Edge was a $60,000 purchase by Darren Weir Racing / John Foote Bloodstock from session two of the 2016 Inglis Premier Yearling Sale from Leanne Smith’s Bucklee Farm draft. Cliff’s Edge is a son of Canford Cliffs out of the Snaadee mare and multiple city winner, Simulation, from the family of French Group 1 winner and USA horse of the year All Along. We were so sorry to lose his dam Simulation who died in November 2016 after a bad case of colic after foaling her Danerich colt, who is now a two-year-old. Named Simulated he has just come back into work, and he’s with Darren Weir too. He is a different type, big and rangy, he is just starting to grow into himself now. He has shown a bit in his jump outs so we are always hopeful, as all of her foals have been winners so far,” Brett said. Simulation also produced Brom’s Girl, a city winning two-year-old and the speedy Delago’s Lad who was stakes-placed in the Listed VRC Maribyrnong Trial Stakes. The Holburt brothers are a loyal supporter of the Victorian breeding industry, has used Blue Gum Farm and Swettenham Stud sires for many years. Brett Holburt is excited to be back in the breeding game this year with two new maiden mares that will both be visiting Swettenham Stud’s Trust In A Gust. “One is one is a half to Cliff’s Edge, called Simbelation by Bel Esprit. We bred and raced her down here, but she wasn’t quite city grade so we sold her on and she went on to win three in Alice Springs. We offered to buy her back, so we could keep the bloodline going and she has just tested positive in foal to Trust In A Gust which is exciting,” Brett said. Their other mare is by Magnus, called Anuddawinna, who Ross bought her as a weanling to pinhook, was retained and will also head to Swettenham this season. Incredibly Brett will be photographing at Wycheproof on Saturday, a decision he made some time ago. 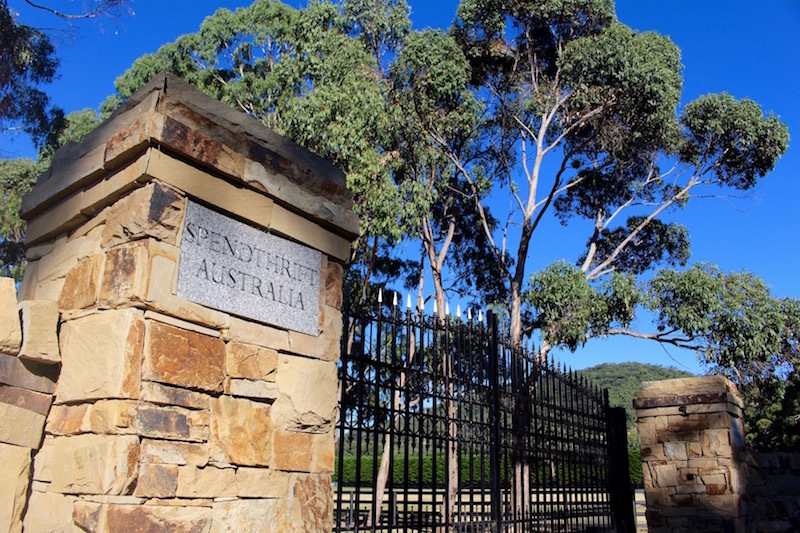 Spendthrift Australia, in conjunction with Fulmen Park Longwood, has come up with an exciting offer for breeders called the “Spendthrift 50 Day Deal”, the farm announced today. “It’s quite simple really: book your mare into any Spendthrift stallion, send her to Fulmen Park Longwood, and for $1,650 inc. GST you are provided with 50 days of agistment, reproductive vet work and walk-on transportation for that mare,” said Garry Cuddy, General Manager at Spendthrift Australia. Spendthrift Australia has four stallions on its “Breed Secure” program, including Hampton Court, Jimmy Creed (USA), Swear and Warrior’s Reward (USA). The farm features two new stallions on its “Share The Upside” program this year, including Sebring’s G2 Stan Fox Stakes-winning son, Gold Standard, and I Am Invincible’s multiple stakes-winning son, Overshare. “We have gone ahead on this arrangement with Fulmen Park Longwood based on the wonderful working relationship we have built in our time in Australia,” added Cuddy. For further information about Spendthrift’s 50 Day Deal, please contact the Spendthrift Australia team at 03 5421 5600, Garry Cuddy at 0410 451 595 or Josh Rix at 0411 116 648. 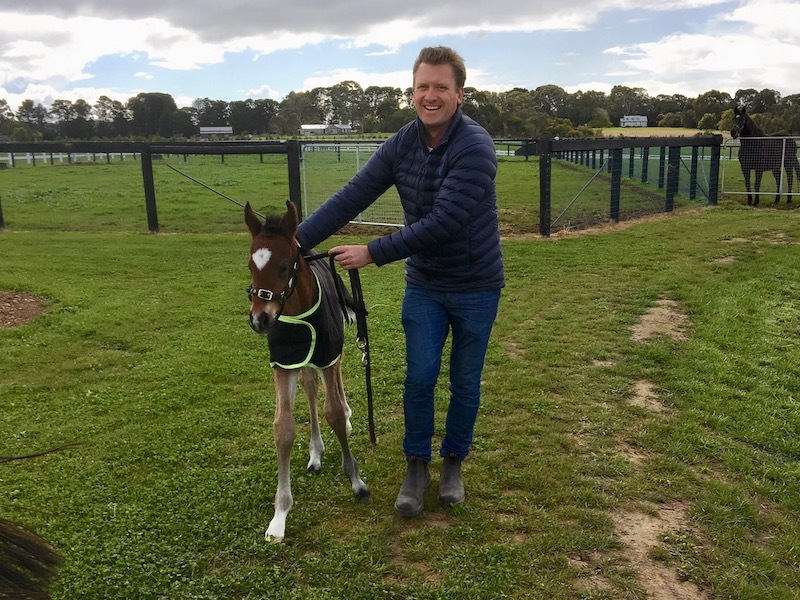 As he admired a plucky chestnut foal who arrived on October 11, 2010 Justin Lovatt dreamed of good things as all breeders of the thoroughbred do, but never did he imagine just how big a journey this horse would take him on. Though he had high hopes with the colt’s full brother Apollo Creed having won a juvenile contest at Flemington just a few months before. And he had faith in the stallion Primus, a well related Group 3 winner with whom he had formed an attachment whilst working with him at Chatswood Stud. Christening his young horse Burning Front, Justin got a group of friends together and put him into work. It was not a flying start with the horse making just an average debut at Donald back in May 2013; seventh of nine. It took a while for Burning Front to break through for that first win, his maiden coming at start number eight – a 1200m even at Sale in April 2014. But an easy victory it was… and it was all up from there. Four years later and Burning Front retires as the winner of 19 of his 60 starts with a further 21 placings to his credit. The most successful VOBIS horse of all time amassing over $500,000 in bonus races; winning over $1.4 million in total. Five times successful at stakes level, Burning Front was seen at his brilliant best taking out the Group 3 Carlyon Stakes on two occasions, the Group 3 R.A Lee Stakes, the Listed Chester Manifold Stakes and the Listed C.S Hayes Memorial Cup. Group 3 placed on another three occasions, Burning Front was successful on ten different tracks from 1000m to 1600m and will best be remembered for his bold front-running style which could crush the confidence of his opponents! “We have been on an unbelievable journey with Burning Front and on behalf of his owners myself and my wife Karli would like to thank everyone involved,” Lovatt said as he announced the eight-year-old’s retirement this week, looking forward to spending time with his favourite horse. Friday night at The Valley marked the launch of the start of the VOBIS Gold Premier Race series, for the season and wasn’t it a truly spectacular affair with Rosemont’s homebred Iconoclasm stealing the show. The last week for Rosemont has certainly been a spectacular one, with their homebred Runaway, winning the Group 3 Geelong Cup before their treasured homebred, Iconoclasm, winning the VOBIS Gold Star at The Valley. On Friday night an elated Anthony Mithen couldn’t praise the VOBIS scheme enough, declaring that he originally had been thinking about sending Iconoclasm to the Group 2 Crystal Mile on Cox Plate Day but decided against it, due to the great bonuses that were on offer for the VOBIS Gold Star. “It’s fantastic to be breeding a horse off the farm by our own stallion with our own mare, that we have had kicking around the farm for a few years, since we bought her. To produce a horse of that quality to win at Stakes level and to go on and get a big chunk of VOBIS Gold money, it’s awesome” Mithen said. The VOBIS Gold Premier Race series features 18 races this season with over $4.45 million in prizemoney and bonuses on offer and given the prizemoney difference of only $20,000, between the VOBIS Gold Star and the Group 2 Crystal Mile, it is quite easy to see why Mithen chose this race for Iconoclasm to target. The team at Rosemont are quite attached to their boy, who they have affectionately named Benson and have turned down offers from international buyers from Hong Kong for their star. The 4 year-old entire is a son of their stallion, Toorak Toff and from their mare Gold Lottey. “He was Gold Lottey’s little boy and we fell in love with him and were getting offers, left, right and centre from Hong Kong, it was testing. Although he might even be able to return the money that was put on offer!” Mithen said. It is safe to say that Benson has a lot of sentimental value for the team at Rosemont and they will be patiently waiting on Saturday to see if their homebred boy can fly the flag for the locals, when he lines up on Derby Day to tackle the $1 million, Group 1 Kennedy Mile. Should Benson be successful in his quest to claim the Kennedy Mile, this Victorian-bred and owned son of Rosemont’s Toorak Toff will certainly shine in his success. Ben & Lizzie Cooper’s Merricks Station has certainly been getting some important visitors at their immaculately appointed property of late and while it may not have been Harry and Meagan, they did recently host the First lady of Racing, Gai Waterhouse for a royal tour of their Mornington Peninsular acreage. 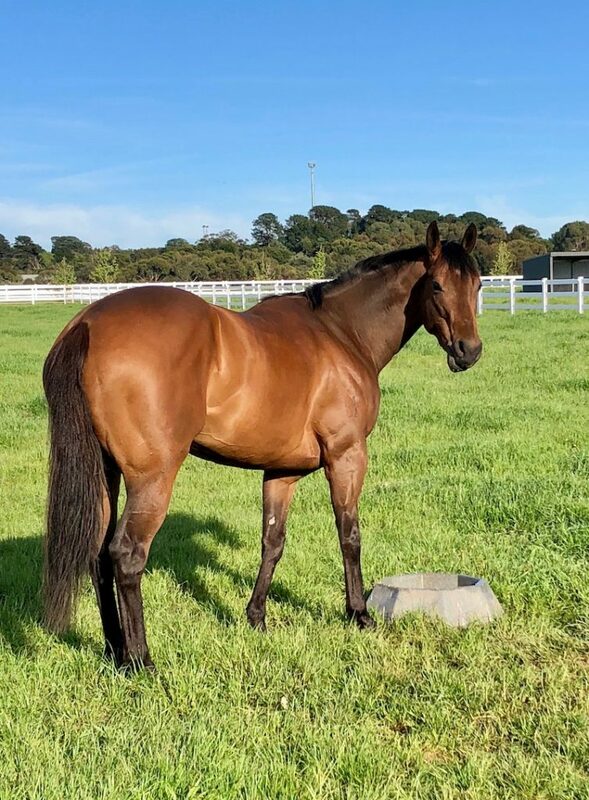 Additionally, the first lady of Moonee Valley, is also in residence, with the recent Group 1 Moir victor, Lloyd Kennewell’s Viddora happily enjoying a well-earned spell on the lush spring pastures. Manager of Merricks Station, Dearne Gess-Jones who has been involved with the farm since its inception, was excited to show off the operation that she is thrilled to be a part of. Gess-Jones had previously managed Musk Creek Farm, and after starting a young family of her own, she remained involved in the industry before coming on board at Merrick’s Station full time. Although busy as Managing Director of Cameron, his family owned and operated commercial and industrial real estate business, Ben Cooper still enjoys the picturesque property as much as possible. “Ben loves getting out on the farm and amongst the horses as much as he can. He doesn’t mind getting dirty and wants to be involved in the day to day running. It’s great as Ben is happy to help with a feed run or foaling and I often ask him to lead a mare or grab a foal.” Gess-Jones said. The property is currently home to Cooper’s dozen or so broodmares, many that he raced successfully himself, as well as the young horses, yearlings, foals and a number of spelling racehorses. Merricks Station boasts state of the art infrastructure that includes a 10-horse walker with a centre round yard, foaling paddock under lights and 24/7 cameras, walk in / walk out boxes, and stable complex for yearling preparation. Coupled with improved lush pastures, gentle, undulating paddocks for development and growth of yearlings and excellent rainfall all year round, it is an idyllic setting catering for horses throughout all stages of their lifespan. Cooper first became involved with racehorses when as an owner in a Matthew Ellerton & Simon Zahra trained galloper, which was the start of a long association with the EZ team. Now EZ Racing train all of Cooper’s horses, and between preparations, his racehorses can enjoy coming up to Merricks Station to spell. Additionally, the operation provides thoroughbred agistment and spelling for other leading trainers, including Lloyd Kennewell’s and his Group 1 sprinter Viddora, who is loving life on the Peninsular. Focusing on the Melbourne market, Cooper will be taking a high-quality draft of seven yearlings to Melbourne Premier next year under the Merricks Station banner, all expertly prepped on farm, which includes yearlings by Written Tycoon and Zoustar. While loyal to the Victorian breeding industry, Cooper welcomed two Written Tycoon foals this season and is looking forward to greeting the first foals from Darley’s Impending next season, a stallion he has bought lifetime breeding rights in. Excited now to watch the Merrick’s Station brand grow and flourish, Ben Cooper is quick to give credit when credit is due. “At the start-up, it’s so important to get a good team around you, like-minded people that share your passion. They are able to give you the right advice and along with Simon & Matt from EZ racing, I have to thank Mat Becker for all his knowledge on selecting the right black type families and brilliant mating plans and Dearne, who has been instrumental for all her advice and hard work to make the farm so functional.” Ben Cooper said. 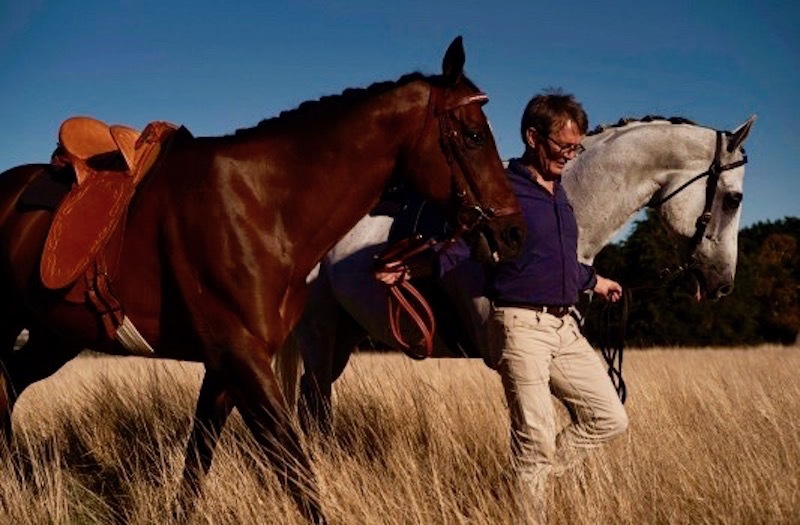 Self-made property millionaire, Michael Drapac may be more well-known for his cycling pursuits, being the owner of the elite professional Tour de France team, Cannondale Drapac; however his other passion, his horses, are now back in his life, front and centre. Having started riding at an early age on relatives’ farms, his love grew through his first horse, an old racehorse called Royal Affair, affectionally known as Red. “I have spent thousands of hours in the saddle, and I’ve ridden hundreds of different horses. My first horse, Red was an extraordinary off the track thoroughbred that you could do anything with. So versatile, the complete athlete. I still keep a photo of him next to my bed,” Drapac said. Following his passion, he began working at the Flemington race track at age 17 strapping, before he started working for bookmakers on course for nearly 20 years. Having invested tens of millions into the sport of cycling, Drapac became increasingly passionate about the holistic development and care of athletes. This theory of holistic development in cycling is one that Drapac believes can be directly compared to his equine athletes when they conclude their racing career on the track. “I was pushing over 20 years ago for horses to be cared for on retirement, and for a levy to be compulsory for owners, but I couldn’t get a single person to listen to me, but now they have realised that the culture must change,” Drapac said. Drapac’s property will be purpose built so that thoroughbred horses, under the brand Full Circle Thoroughbreds, can be educated, trained, re-educated and responsibly re-homed. With a state of the art indoor being built, along with a cross-country course, the finest fencing, undulating paddocks and stables available, thoroughbreds will be given the opportunity to flourish in the best facilities money can buy. “I will be spending about $25 million on the complex for rehabilitation and re-education of racehorses, and we will be looking at new and innovative ways to breed, raise, race and re-purposing athletes to enable sustainability post their elite sporting career,” Drapac said. Under the banner Full Circle Thoroughbreds, Drapac has a small broodmare band numbering seven that reside at Flannery’s Springmount and he has supported the local stallion farms including Sun Stud’s Fiorente. Additionally, Drapac also has a passion for the Australian Stock Saddle and his collection now numbers 200 individual hand-crafted pieces which he is looking forward to sharing with others. Brilliant Golden Slipper runner-up to Sebring as a two-year-old, Von Costa de Hero featured a new stakes-winner for the handsome Riverbank Farm sire, when Von Costa Glass won the Listed Murray Bridge Gold Cup. The seven-year-old settled comfortably at the tail of the field, before apprentice Racquel Clark sent the gelding forward when the leaders backed off the pace around the home bend. In the twinkling of an eye, Von Costa Glass was alongside the leading duo and travelling like the winner. A progressive galloper that has now won seven of 18 starts earning over $200,000 in prize money, the Sue Jaensch trained Von Costa Glass won the 1600 metre contest by a three-quarters of a length. Riverbank Farm’s Caroline Duddy, who proudly stands his sire Von Costa De Hero, was thrilled for the hardworking trainer and loyal client of the stud. “The Von Costa’s are proving that they are getting better and better with age, and Von Costa Glass winning a listed race as a seven-year-old is living proof. They definitely have the longevity which all owners and breeders aim for!” Duddy said. The handsome son of champion stallion Encosta de Lago, Von Costa De Hero, won at just his third start, the Group 2 Sires’ Produce Stakes at Flemington with an impressive turn of foot. Proving that he deserved to race in elite company, he competitively claimed game thirds in the Group 3 Caulfield Guineas Prelude and the Group 1 Caulfield Guineas won by Whobegotyou. Additionally a close up fourth in Northern Meteor’s Group 1 Coolmore Stud Stakes, a gallant third against the older sprinters in the Group 2 Norman Carlyon Stakes and a late charging runner-up in the Group 1 Australian Guineas won by Heart Of Dreams. Retiring to stud as the winner of over $1.1 million in stakes, Von Costa de Hero has many fans amongst owners and breeders with Von Costa de Hero’s first crop of now seven-year-olds having produced 33 winners from 54 runners – an incredible 61.1% winners-to-runners strike rate. “His stats are really good, and with 21 winners from his 35 second crop runners, it shows that good things come to those who wait,” Duddy said. Described by Riverbank Farm’s Russell Osborne as “fantastic to deal with,” Von Costa de Hero stands at a great value fee of $2200. For Victorian hobby breeder, Jane Kaufmann, a self-confessed novice, she must be doing something right when Eduardo captured the Group 2 Caulfield Sprint over 1000m. Enjoying the thrill of a lifetime, Kaufmann’s come-from-nowhere flyer, won his first stakes race brilliantly and will now be surely eyeing off bigger and better prizes. Having finished a head second to I Am Excited in the Group 2 Gilgai Stakes over 1200m at Flemington, it has been a remarkable rise for Eduardo who was only first sighted at Moe in June when winning his maiden, by six lengths no less, over 1117m. Courtesy of the Caulfield Sprint, he impressive record boasts three wins and two seconds from five outings. Kaufmann first got into breeding about ten years ago, purchasing a Sovereign Red mare, Tootsie Goodbye, for $1,000 at the Inglis December Sale. “My daughter was into eventing, and I actually went to the sale looking to buy something for her, when I saw the mare,” Kaufmann reveals. “She was in foal to Khyber Pass and produced Bye Bella, who won three races. I then purchased a Rubiton mare (Bucolic) quite cheaply and she ended up producing Freelander, who won a race for me too. And not just special for Kaufmann and Cresci. Eduardo’s short career, thus far, mirrors that of his Cranbourne trainer, Sarah Zschoke, who has only been licensed to train in Victoria since 2013 and has six in work. Originally an apprentice jockey in Tasmania, Cranbourne based Zschoke shifted to the mainland after one season as a trainer in the Apple Isle. “It’s only a small team with about 12 winners to date, but clearly Eduardo is the pick of the bunch. I got him (Eduardo) as a late three-year-old and he arrived with a couple of other horses and I said then if any of them are any good it will be him. Eduardo has been ridden in each of starts by Zschoke’s partner, Brian Park, who steered Zip Zip Aray to win the 2002 Group 1 Goodwood Handicap in Adelaide but would declare that Eduardo’s Caulfield Sprint was his greatest thrill to date. Eduardo is a son of Host, who formally stood at Nagambie’s Swettenham Stud. Since 2015, he now stands at Willow Grove Stud in Woodside, South Australia. It was well over thirty years ago that Ballarat veterinarian Dr Kim McKellar took a call to give a Thoroughbred named Bonecrusher an ECG on the back of a poor run. Today it is easy to draw the parallels between the mighty Kiwi galloper and what Dr McKellar is trying to achieve at Wyndholm Park, the stud he owns with wife Liz. Kim what sparked your interest in Thoroughbreds? Wyndholm Park is not focused on churning out precocious types for yearling sales, rather “the farm’s “raison d’étre” is to give breeders who want to own and race their own horses a variety of stallions at prices that make commercial sense,” McKellar said. Looking at the Wyndholm Park roster, its small but diverse mix is led by Victoria Derby winner, Rebel Raider. He has been serving commercial numbers between 80 and 100 plus mares recently, and the great thing is he is super-fertile, generally around the 90% mark. He’ll often get sent mares that have spent the spring without success and the owners want one last shot at getting the mare in foal. He just nails them first time. He’s just fantastic. You also stand the impressive grey son of Shamadal, Crackerjack King. “You only have to look Crackerjack King’s pedigree to see he has class. His dam has to be one of the world’s leading broodmares. How few mares are there that can produce five individual Stakes winners, three of them Group 1 winners. He was hardy, travelled the world to race and acclimatised quickly to our conditions when third in the Underwood Stakes-Group 1. Shamardal’s stock have done a great job in Australia with the likes of Faint Perfume and Puissance De Lune and now he is showing he is a sire of sires with Lope De Vega getting recent Group 1 Santa Ana Lane. The third stallion Sports Edition is an imposing sprinting type offering speed to mare owners. “We are watching what the market thinks of the young sons of Northern Meteor. Zoustar’s early results suggest he is going to make it so it is nice to be able to offer an inexpensive stallion by the sire. Like Rebel Raider and “Cracker”, Sports Edition has pedigree as he’s a brother to a Group 1 winner in Amanpour and a half-brother to the dam of Rapper Dragon who was so revered in Hong Kong. The good thing with him is we can recommend him to owners whose mare need speed in the pedigree. Do you think there is a strong market for stallions in that range in Victoria? What advice would you have for anyone just entering the industry? Living up to his reputation as a foolproof racehorse, Written By jumped to the front and made every post a winner in Wednesday’s $350,000 Group 3 Blue Sapphire Stakes (1200m) at Caulfield. Perfectly rated by regular rider Jordan Childs, the son of Written Tycoon fought off the challenge of Tony Nicconi when turning for home before safely holding the challenge of Group 2 Danehill Stakes winner Encryption (Lonhro) by a length and a quarter with Tony Nicconi (Nicconi) a further two and three-quarter lengths back in third. Winner of the Group 1 Blue Diamond Stakes over the same course and distance last season, Written By advances his record to six wins from seven starts with earnings of $1,713,500. His only defeat came when fourth behind Estijaab in the Group 1 Golden Slipper at Rosehill Gardens on March 24. 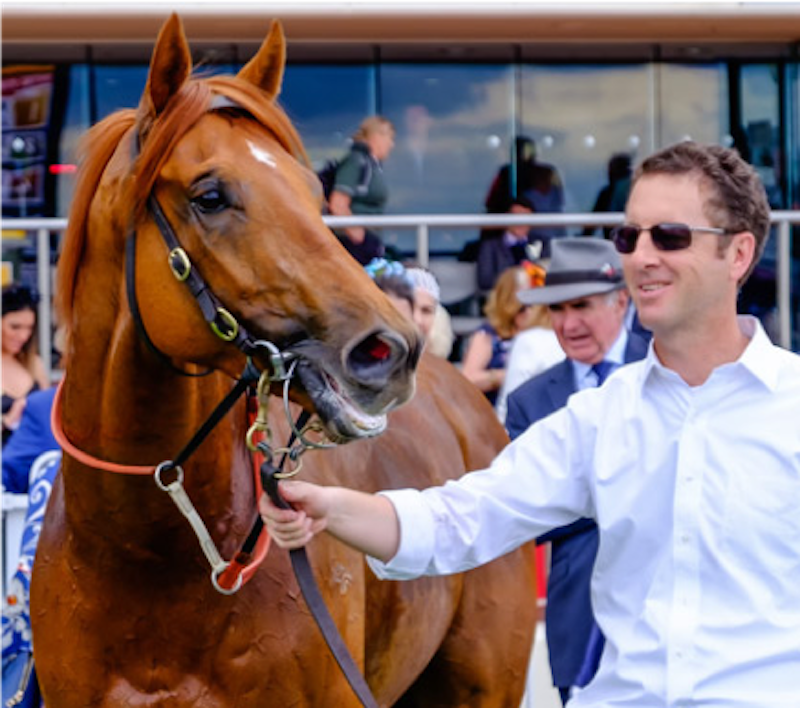 Winning trainer Grahame Begg said the chestnut will head to the Group 1 Coolmore Stud Stakes where he will most likely meet Encryption again. “He’s got a very high cruising speed and I said to Jordy use it to your advantage. He’s got a good understanding of the horse and lets him roll,” Beggs said. Bred by Begg’s father Neville, Written By is a half-brother to three winners. He was consigned to the Inglis Premier Yearling Sale by Basinghall Farm and was retained to race when he didn’t make his deserved $200,000 reserve. Written By is out of the winning Tobougg mare Yau Chin, who was purchased by Neville Begg for just $3,000 at the 2007 Scone Yearling Sale. Yau Chin has a two-year-old brother to Written By and a yearling colt by Sun Stud’s Fiorente (IRE) who has already been named Wise Dragon. Written By adds the first black-type in five generations, dating back to the Kaoru Star mare No Finer a sister to the top-class racehorses Marceau, Zasu and Joy Love and the dam of four stakes winners including the Group 1 Australian Guineas winner and top-class sire Pins and the Group 2 Shannon Stakes winner Nips. What a great headliner for Redente is Just Stellar, the gutsy and talented mare living up to her name as being one of the most successful horses by number of wins in Victoria this year. She is the leading Victorian provincial horse by numbers of wins for the season having won four of six since the start of August… the Christopher Davies trained six-year-old is flying! Not having much luck in the two defeats amongst that winning run, Just Stellar has amassed over $135,000 for her happy connections and her breeders Russell Osborne and Dr Caroline Duddy of Riverbank Farm have been cheering her on. With his reputation as a fine horseman, Christopher Davies was chosen to train Just Stellar due to her strong personality and he is very glad to have her. “She can be difficult, but we respect each other,” he said, so impressed by the mare (“she is a powerhouse who has everything you want in a horse”) that he has become a firm fan of her sire, buying others and breeding his own. “We just love them, and we are very excited about getting them to the track,” he enthused. “They are just so absolutely tough and hard, they are good strong horses who thrive on their work. In fact, the harder I work Just Stellar, the more she gives,” he said, adding that he is hopeful of securing a run in a Listed race for her next time out. Also, breeders of Just Stellar’s five times winning sister, Riverbank Farm has been home to the unraced but spectacularly bred Redente since his retirement to stud in 2009. From day one he proved his worth, his first small crop producing just 13 runners, nine of whom have been winners; a strike rate in excess of 69%. His second crop performed even better; 12 winners from 17 runners; between them the winners of 41 races. Redente’s third crop, from which Just Stellar hails, has produced 72.7% winners-to-runners; 16 winners from 22 runners winning 39 races. Which just goes to show that Redente is the perfect choice for the owner/breeder, a stallion whose progeny really know how to find the line – in the process providing their connections with a whole lot of fun! Well over a third of Redente’s winners have won at least four races including his Redentes Edge (nine wins), Just Stellar (seven wins), Squeaky Squirrel (seven wins), Aunty Elsie (six wins) and Grey Strike (six wins). All but two of Redente’s first 70 runners have earned prize money… some feat for a horse who did not make it to the track himself! 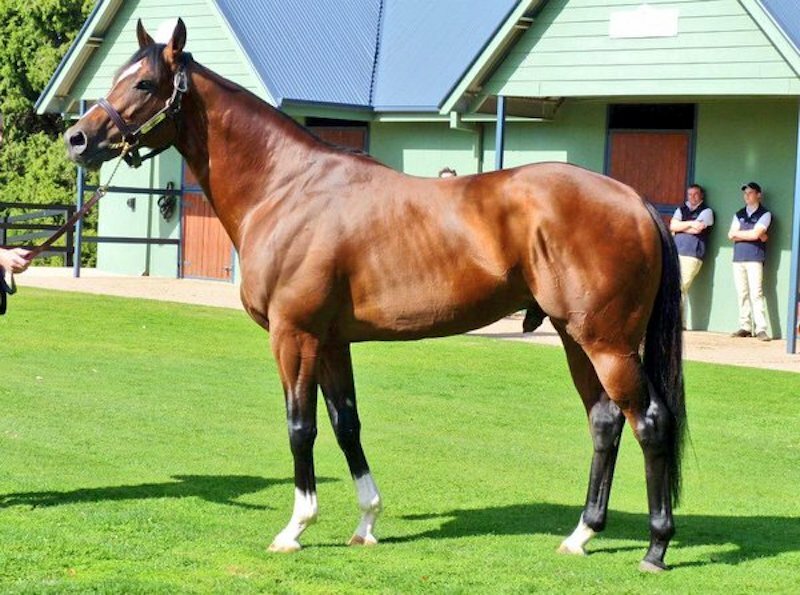 But pedigree can so often overcome performance and Redente (who incurred a foot injury as a yearling) is as well-bred as they come, being a son of super stallion Redoute’s Choice, three time Australian Champion Sire of 160 stakes winners. And what a family it is from which Redente hails, his dam Stella Cadente – Group 1 winner of the Australia Stakes – producing six winners including the Gimcrack Stakes winner Brilliant Bisc and the stakes-placed Starfish. That’s a lot of black type under one mare’s name and there is so much more around her, Stella Cadente being out of the Group 1 placed Temple Fire, grandam of stakes winner At The Oasis and daughter of the wonderful mare Eau d’Etoile. The Eulogy Stakes winner proved to be one of the best broodmares of the 1990s, producing the marvellous gallopers Bint Marscay (Golden Slipper Stakes), Filante (Epsom Handicap, Caulfield Stakes) and Kenny’s Best Pal (Australian Guineas). A real favourite at Riverbank, the imposing Redente stamps his progeny and the best is still to come with his support, on the back of his terrific early success, increasing considerably in recent years. “We expect to see another surge of Redente winners as they come through,” Dr Duddy said, noting that he served 104 mares in 2016 and 81 the previous year. There has been a switch in personnel at Thoroughbred Breeders Victoria with Executive Officer Patrick Clancy finishing up after almost three and a half years in charge. Charmein Bukovec, previously of Racing Victoria, has taken over the position and aims to extend the growth of TBV and the industry it represents across the state. The change comes at a time when the Victorian industry is experiencing enormous international investment, huge popularity of new sires and great success of Victorian bred horses on the racetrack. TBV President James O’Brien said Patrick would be a loss for the organisation, but the committee was thrilled to appoint Charmein who already has a good understanding of the racing and breeding industry, including experience working with VOBIS at Racing Victoria. 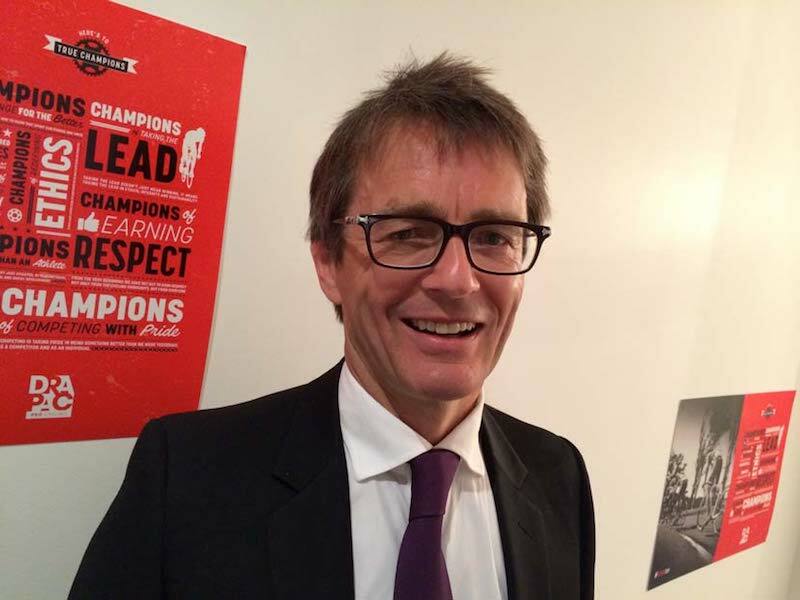 “Patrick has completely changed the organisation since his appointment in 2015 giving it a national profile and massively increasing its engagement with breeders, sales companies, racing regulators, governments and sponsors. “During Patrick’s time, our social media exposure has increased 30-fold over the past three years, our sponsorship revenue has almost tripled and membership has grown significantly. And our weekly e-newsletter is now one of the best regular breeding publications in Australia. “Patrick also played a key role in the establishment of VOBIS Sires and the naming of the $1 million VOBIS Sires 2YO race as ‘The Showdown’. “We are rapt to have Charmein on board and she is already going full-steam ahead,” James said. “In the short time she has been in the office, she has already covered the Inglis Ready2Race sale, started preparations for our annual Victorian Breeders Awards night (6th December at Flemington) and met with RV officials to discuss enhancements of VOBIS. 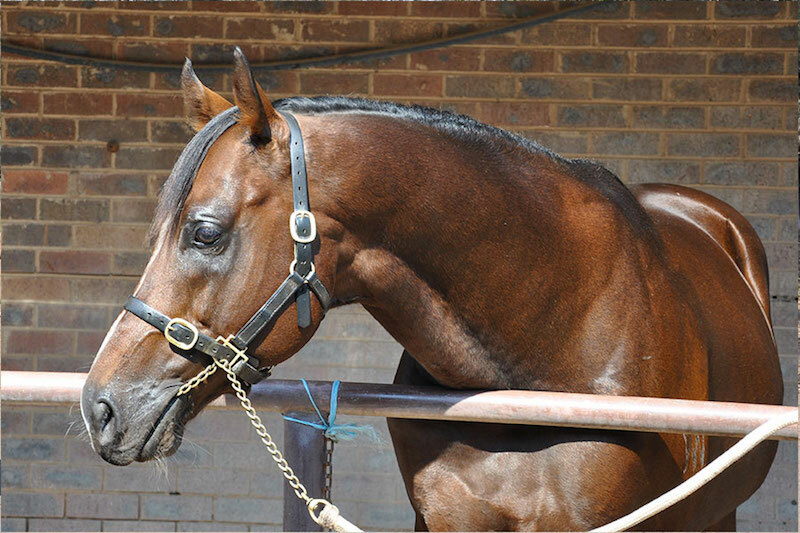 “Charmein has a strong love of thoroughbreds, being an enthusiastic rider and owner of a Victorian bred racehorse. 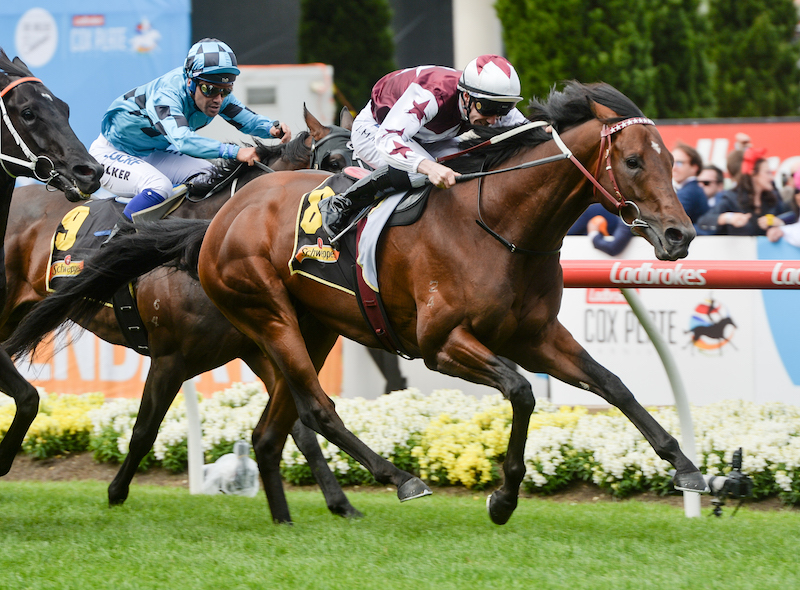 Rosemont’s homebred Iconoclasm could now be set for a Group 1 at Flemington after bouncing back to winning form at Caulfield in his first start since undergoing throat surgery. Rosemont was particularly chuffed with Iconoclasm’s win as it was the first stakes win for Toorak Toff, who they still own but is standing this season at Kingsley Park in Tasmania. 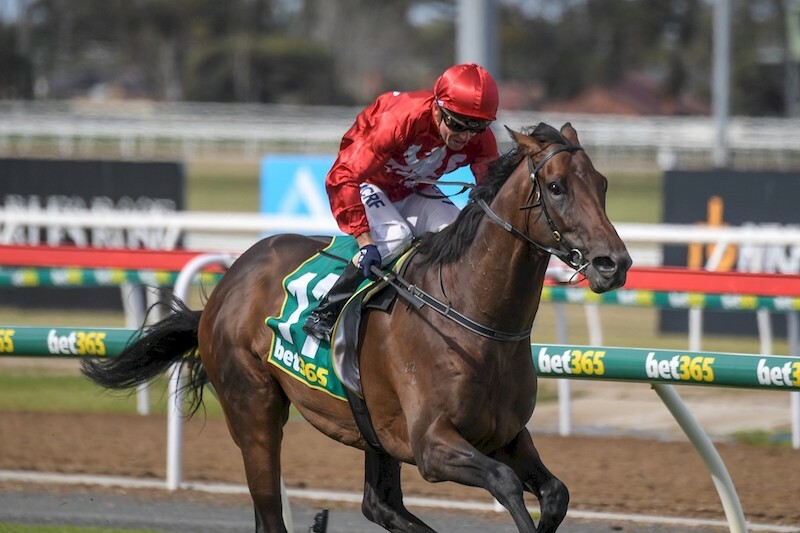 Flying the red and white gatecrasher silks, the Darren Weir-trained galloper was given an inspired ride by Ben Allen in the Listed Weekend Hussler Stakes over 1400 metres. Drawing away by over two lengths, he advanced his overall record to 6 wins and 2 thirds from 11 starts with earnings of $403,865. 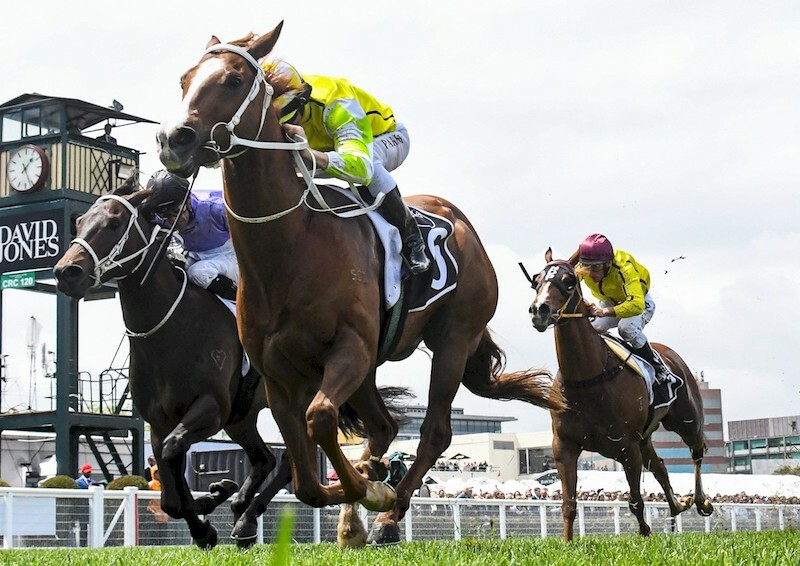 Iconoclasm’s part-owner, Rosemont Stud’s Anthony Mithen, hopes Saturday’s victory will push the horse’s rating up enough to get into the Group 1 Kennedy Mile (Cantala Stakes) over 1600 metres on Derby Day. “Caufield Guineas Day and VRC Derby Day are the two days anyone racing a horse wants to get to, and it’s nice to think he could race on both those days,” he said. Mithen took time to reflect on Iconoclasm’s dam Gold Lottey (Encosta de Lago) who died last month shortly after foaling a Choisir filly. Gold Lottey was the winner of the Group 3 MVRC WH Stocks Stakes, the Group 3 VRC Vanity and the Listed AJC Wiggle Quality Handicap and was placed in the Group 1 South Australian Oaks. Gold Lottey was purchased by Rosemont for $64,000 at the 2012 Inglis Easter Broodmare Sale. 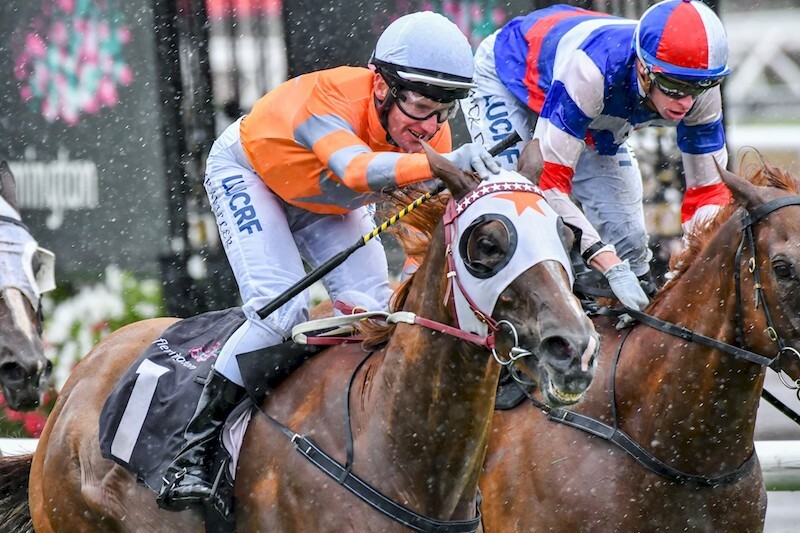 “He’s Toorak Toff’s first stakes-winner, he’s a horse we bred at our farm with Ash Hardwick, our cousin, and we’ve loved him from day one,” Mithen said. “We don’t keep many colts, but we just loved him, and he’s out of our beautiful old mare Gold Lottey who we lost this year foaling, which was a tragedy. 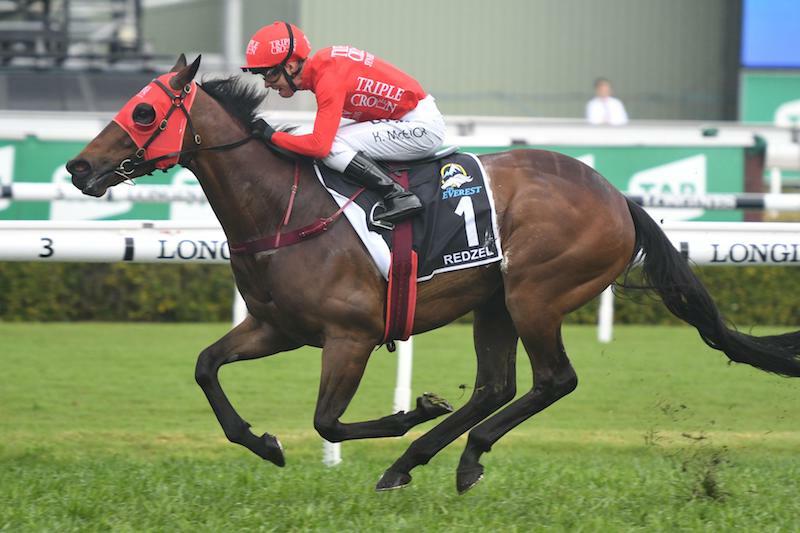 The Eliza Park Victorian bred Redzel took his earnings to a staggering $15,372,000 when successfully defending his crown in Saturday’s $13 million Everest (1200m) at Randwick. This second Everest win brought great joy to the several Eliza Park staff who cared for him after he was born in September 2012. With Kerrin McEvoy again in the saddle, the Peter and Paul Snowden-trained gelding dominated the race from the front on a rain-sodden surface to defeat Trapeze Artist by one and a quarter lengths..
Redzel is the tenth living foal and second stakes-winner, (also including Group 3 winner, now Rangal Park sire Danerich), for the former top-class Rubiton mare Millrich. A winner of the Group 3 Sweet Embrace Stakes, Millrich was also placed in the Group 1 Golden Slipper, Group 2 Silver Shadow Stakes, Group 2 Magic Night Stakes and Group 2 San Domenico Stakes. Redzel would be her eleventh but sadly and final foal as just a few weeks after Redzel was born Millrich passed away due to laminitis. Now known as the likely the most successful orphan to grace the track, Redzel was sold as a weanling when Eliza Park faced financial difficulties and was placed into receivership. Sold through the 2013 Inglis Australian Weanling Sale at Newmarket for $45,000 to Marquee Stud, Redzel, being an orphan foal had become a staff favourite. Long time Eliza Park employees Jenny Saunders and John Jeffs said the tough little colt was always a standout. “I remember him as a gorgeous colt when he was a weanling. He looked like he still had so much improvement in him, but the raw product was there to be seen,” Jeffs said this week. 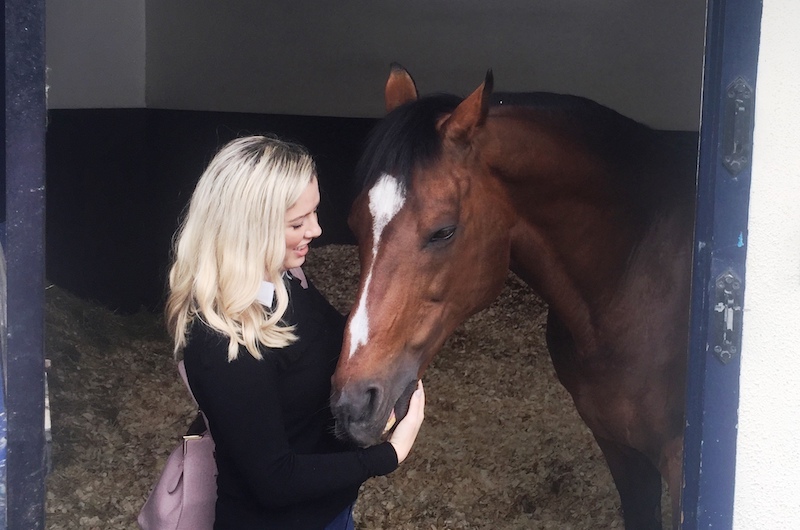 “Later when he was sold as a yearling for $120,000 by Marquee Stud at the Magic Millions Gold Coast sale, Jenny Saunders our yearling manager, excitedly came up to me and said that she had found our boy and to come and have a look at him. “Well, we walked around the back and saw that he had developed and grown into the most beautiful yearling you’d ever seen in your life. He had the right attitude that has carried him in good stead into his incredible racing career. The rest is history I guess. Although the lead up for Redzel to defend his Everest title wasn’t perfect, becoming cast in his box on the eve of The Shorts, and then being unplaced in his next run in the Group 2 Premiere Stakes at Randwick,, it didn’t stop him taking out the big race on Saturday.